For most people, real estate is usually the largest investment they will ever make, yet many people do so without knowing the condition of the property they are purchasing. Having a certified inspector identify any problems concerning preexisting damage and safety issues with the property is one of the best preventive investments a buyer can purchase. I provide buyers, sellers, property owners, and agents with important information essential to evaluating the condition of a property. I meet and exceed ASHI standards of Practice. Through inspection, consultation and detail reporting, I will provide you with valuable information about the condition of the home, including: exterior, structure, roofing, electrical, heating/air conditioning, plumbing, insulation, and the interior. For your largest investment, you deserve the best inspection. With my reputation for thoroughness, reliability and professionalism, I am qualified to assist you with all your inspection needs. I provide you with integrity, professionalism and the training required to complete the job. Your understanding of the inspection findings are critical to achieve my goal of providing the best customer service available. I encourage you to accompany me through the inspection process to receive a complete consultation and a valuable orientation to the property and its systems. When you�re ready, so am I. Call me today to schedule a convenient time for your inspection. 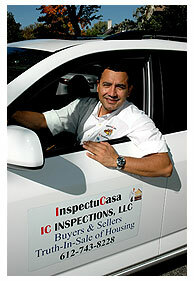 You�ll be glad you chose IC Inspections. Call us today to schedule your inspection!